Tan takes you on a Seattle Happy Hour tour. Weigh in? In case you missed Tan Vinh’s tour of terrific happy hour-haunts in today’s Ticket, be sure to take a look. As you probably already know if you spend much time here on All You Can Eat, my happiest happy hours are spent lifting one in the comfort of my home, noshing on Planter’s Cocktail Peanuts and Trader Joe’s Pretzel Slims. 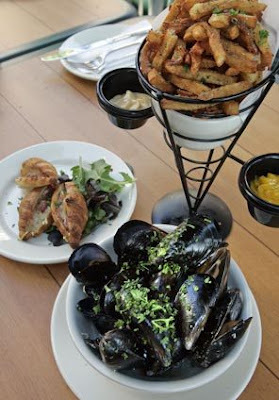 Tan’s picks offer far more exciting options for great happy hour eats, and the accompanying photo of the moules at Maximillien look like something I could dive into right about now. Anyway, I was wondering: Did Tan miss your favorite happy hour-stop? Does your restaurant offer a happy hour he’s ignored? Feel free to give it a shout-out right here. And now, it’s off to get happy and enjoy the weekend. You do the same, OK?